Although cooking for one often has a bad reputation, it can also have an array of perks. Single people have the power to decide exactly what they want, when they want it, and whether or not they even want to cook in the first place. However, cooking for one can also be a bit of a frustrating process. Apart from trying to figure out what to make, it’s frustrating and expensive to buy a bunch of groceries for one recipe, only to end up not using all of them, and having them spoil and go to waste. Even worse is to have a ton of leftovers that you get tired of eating, so you end up wasting those as well. Unfortunately, recipes aren’t always friendly to the single cook. They’re often for at least four people and usually contain a list of ingredients you don’t have on hand, but will probably only use once. If you want to eat healthy and save money, you still need to cook rather than opting for takeout every night. Thankfully, you can still cook without spending a fortune. 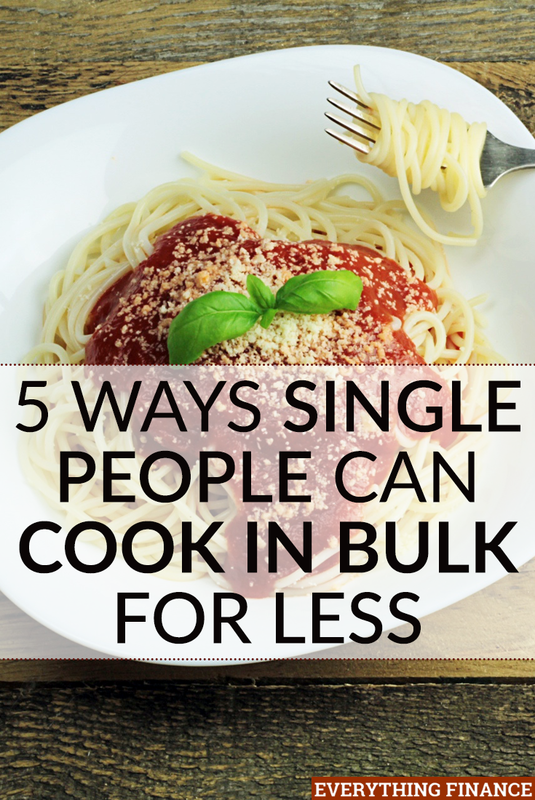 Here are five ways single people can cook in bulk for less, without the waste. This may cost you more upfront, but you will save money in the long run. A vacuum sealer can help you save those groceries that might otherwise expire and go to waste before you get the chance to use them. For example, if you find meat on sale in a larger package, you can use what you need and vacuum seal the rest. It works for cooked items as well. Everything from cooked veggies to meatballs, and even cookie dough, can be sealed in individual portions to be taken out of the freezer whenever you feel like using them. Unlike other methods, vacuum sealed items keep pretty much forever. There’s no risk of freezer burn or juices leaking out since the process seals it shut extremely tight. You could have weeks of meals ahead of you without spending a dime on groceries while you use the stock in your freezer. One of the biggest problems of cooking in bulk as a single person is the fact that you just get tired of eating the same thing day after day. You may think you’ll save money by cooking one recipe and eating it throughout the week. However, if you’re like me, after the second meal or so, it’s too tedious to keep eating the same thing. This ultimately leads to you tossing the rest in the garbage. Of course, that also means that you don’t save money. A great alternative is to prep weekly meals that use similar ingredients, but are different enough that you won’t get sick of them. Think of everything from salads to sandwiches to cheese, crackers and sausage. If you switch out a few major ingredients like the toppings, or the dressing on your salads, or the meat in your sandwiches, or vary the cheeses and crackers you use, you’ll keep meals fresh, but also use the groceries you bought so nothing goes to waste. This goes along with the vacuum sealer, but a freezer is the best tool so single people can cook in bulk. Whether you use it to divvy out raw ingredients for later, or to bake and freeze an array of recipes to have on hand, your freezer can help you save big. If you purchase raw ingredients that you know you won’t be able to use all at once, freezing is always a great option, especially for fruit. Bread is another ingredient that can be prolonged by the freezer. It can be almost impossible to use up an entire loaf on your own before it gets dry or stale, but by freezing it, you can take out what you need and keep the rest fresh. Another option is to cook and bake a variety of recipes, divide them into individual servings, and freeze those as well. You won’t be stuck eating the same thing everyday as you can mix it up, but it also gives you a cost-efficient way to cook in bulk. Furthermore, by browsing Pinterest, you can find great ways to assemble and freeze ingredients ahead of time and then cook them in a slow cooker. By freezing meals, single people can cook in bulk and save without worrying about their meals spoiling. Although this option does require you to eat the same thing more than once, pasta and soup are great, cheap items single people can cook in bulk. Since you can find great soup and pasta recipes that only use a few ingredients, you won’t spend a fortune on a long grocery list. As far as leftovers go, I find that soup and pasta tend to be the dishes that taste the best the longest. Pasta is great to freeze if you make too much and is an ingredient that lasts quite awhile uncooked. If leftovers really aren’t your thing, there are ways to switch it up without letting food go to waste. Make it a point once a week, probably on the weekend, to try and use the ingredients you have leftover in the fridge. You can search for recipes by ingredients for ideas, or get creative yourself and find ways to incorporate your leftover items into a new dish. If you have a bunch of veggies, you could throw them into a frittata or on a pizza. You could make a new pasta dish or throw everything into a soup. By learning to use what you have, you won’t waste the food you spent money on or be stuck eating a meal on repeat. Cooking can be a fun and relaxing pastime, but if you’re single, cooking can become more of an inconvenience than anything. However, that shouldn’t force you to reach for the takeout menu every night either. By getting a little creative and utilizing a few simple tools, single people can cook in bulk without letting food spoil. What are some tips you’ve found helpful when cooking for one? Do you have any creative ways to use leftovers?